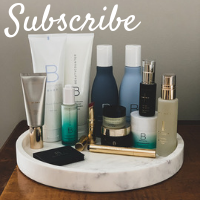 You are here: Home / Lifestyle / Happy. 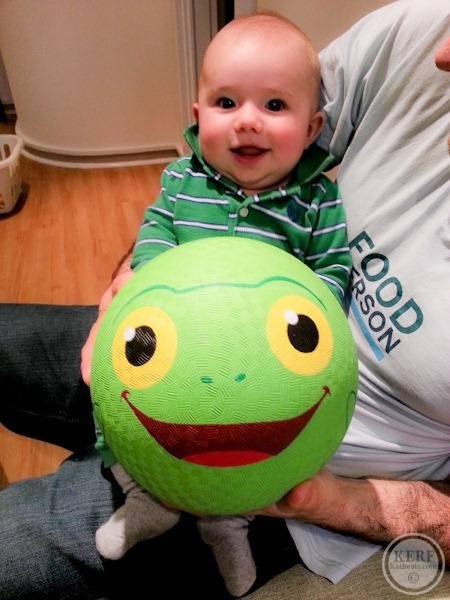 Here’s a big green ball to cheer you up for the weekend! I had to replicate last week’s Hot Apple Bread Yogurt dish. A Greek yogurt base, plus microwaved apple (one day I should sauté it for ultimate flavor), pieces of apple bread, cinnamon, chia seeds and old fashioned peanut butter. My lunch break was quick. It’s breaking my heart how fast I have to eat now! Actually eating lunch > enjoying every bite. Almonds for a snack. Wish these had been roasted + salted. Or better yet, almond-buttered. 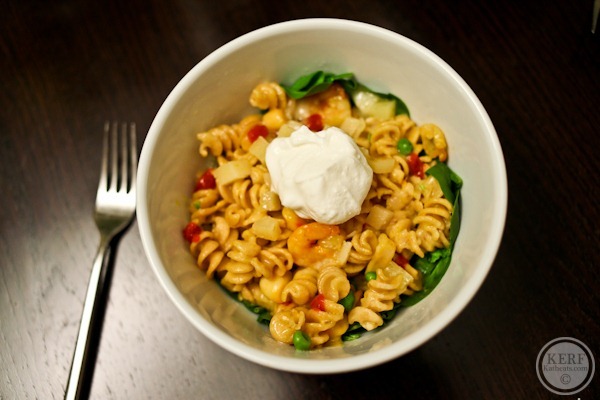 We put the salad underneath before heating so the spinach wilted and added some Greek yogurt on top – sort of like a mac & cheese made with sour cream. It was a cold one today, but it’s supposed to be warm tomorrow! I’m right there with you on the lack of sleep! It’s been five days, FIVE DAYS and my right eye won’t stop twitching. I went to bed at 9 last night too and the madness began at 11. I need to eat my frustration in the form of your Hot Apple Bread Yogurt dish. I have a feeling it would make me a little less crazy right now. Love those two big smiles! Happy weekend. 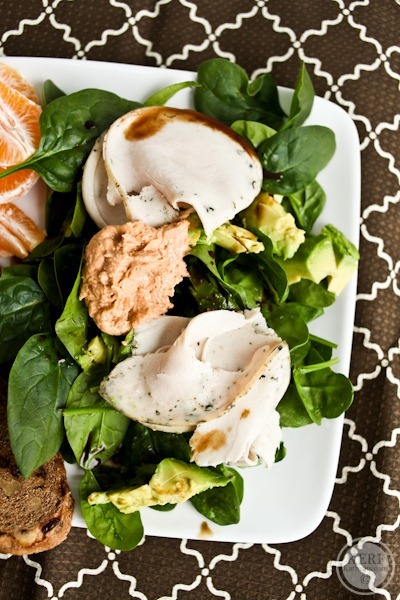 I love having fresh turkey on salads! One of my favorite toppers for sure! Nothing like seeing a cute pic of the lil man to get the morning started. I’m sure more leisurely meals are in your future. You’ll definitely savor every bite when that happens! 🙂 Have a great weekend and give the lil one a smooch…because he can never have too many! 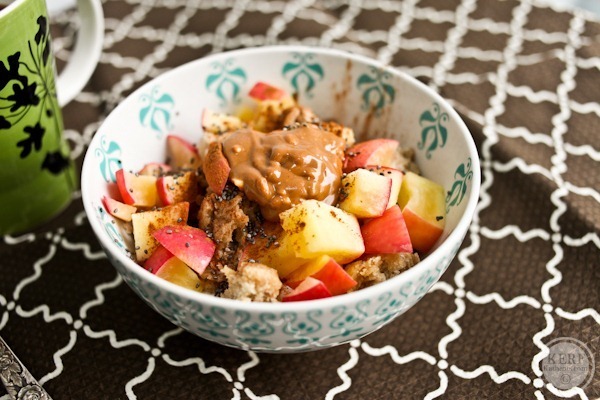 Love the idea of sautéing the apple before you add it to the greek yogurt bowl! I’ve been on a huge greek yogurt kick lately and am looking to jazz it up a little bit, so this post came at a perfect time! I love nights when I don’t dirty any dishes! kath, funny that you titled this Happy. Just now watching a documentary on Netflix called Happy. A must see for sure…….Hope you enjoy your day! Oh and Hubby and I are on season 4 of Lost. Keep thinking of you because we can’t stop watching the episodes! That baby is getting cuter and cuter! 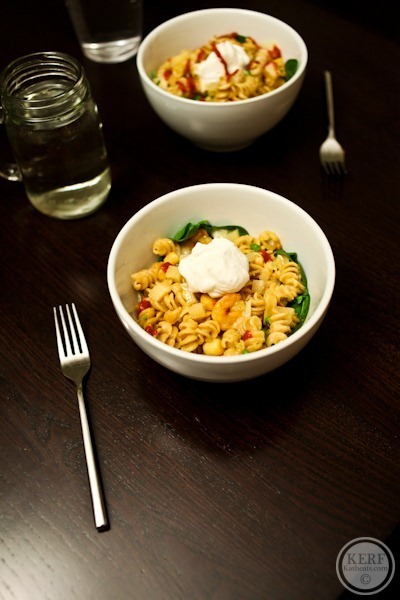 Can’t wait for your mac and cheese recipe – I’m starting to think I need to make mine healthier, with butternut squash and less cheese? Although cheese is my favorite food group! Sorry the sleep isn’t getting better yet. 🙁 Modified sleep-training/crying it out was a lifesaver for us around months 4-5. Cute little double chin. What a great smile. So I never tried avocado because it’s not a common food in Germany, but have bought one today. How long can I keep it? And how long does it last after I cut it? You’re going to want to wait to cut it until it is very slightly soft. It’s hard to get the ripeness just right on these. Keep it outside the refrigerator if it’s not quite ripe yet. To get the longest mileage out of an avocado, store it with the pit — it helps to prevent browning. For example, if I use half of an avocado for breakfast, I’ll take the half with the pit still in it, squeeze lemon juice over it and put it in a ziploc bag in the fridge — it will last a max of 24 hours after that, but I usually try to eat it at lunch. 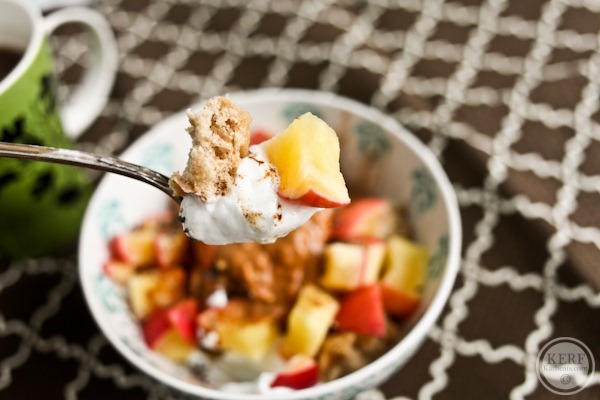 I love the look of that cinnamon apple yogurt bowl! I used to microwave apples with cinnamon on them, delicious and quick! That green ball is CUTE! Hope you and your family have a great weekend! 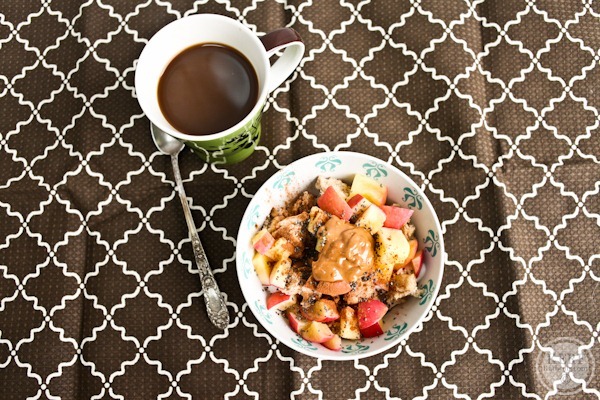 Two comments: One of my favorite oatmeal combos involve sautéing an apple in a little coconut oil and lots of cinnamon and stirring it into the oatmeal at the last two minutes or so of cooking.. such a great combo! The other comment is about the eating fast thing. I have 3 girls.. and only in the last year (my oldest is 7 going on 8) have I realized just how fast my husband and I were eating! It took my grandmother to realize it one day when the girls weren’t even with me! Anyway, Unfortunately a side effect of that sort of thing is then eating things you don’t realize you’re eating. Lots of bad habits came up for me on that, and it’s taken the last 4 months to undo all that. Now that my youngest is going on 3, I can make sure that I take my time to enjoy every meal. It’s amazing how much overeating you can avoid by doing those little things. Luckily, you’ve already done the nutritional legwork to know the best steps to avoid that. I love your blog and seeing how I should have done early parenting days… instead of all the fast food and ‘quick junk’. No regrets though, I love love love my girls and now I’m in the best shape of my life so it’s all good. Love the smiley ball and sweet smiley boy!! Oooh, love the yummy breakfast! May do that for myself tomorrow! That first picture made me smile! He is just so adorable! 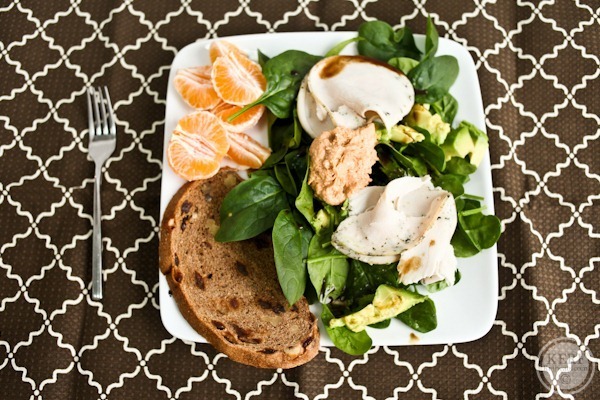 Gorgeous looking meals. My wife and I are experiencing the the lack of sleep and time crunch from our 1 month old cutie-pie daughter. We seize every opportunity be it sleep, food, fresh clothes. The expericence has enhanced every little detail we thought mundane before. 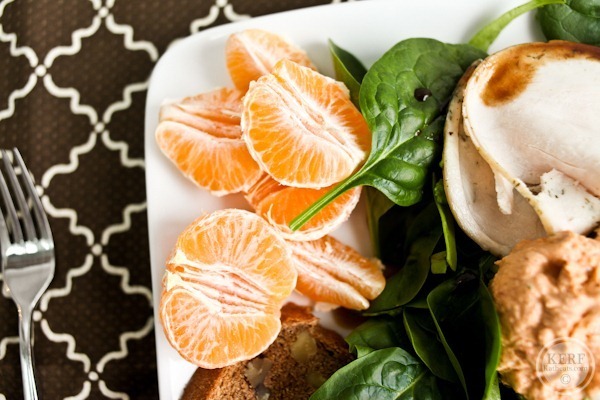 Every meal put on the table should come as a victory! I cant wait for the mac n cheese recipe! 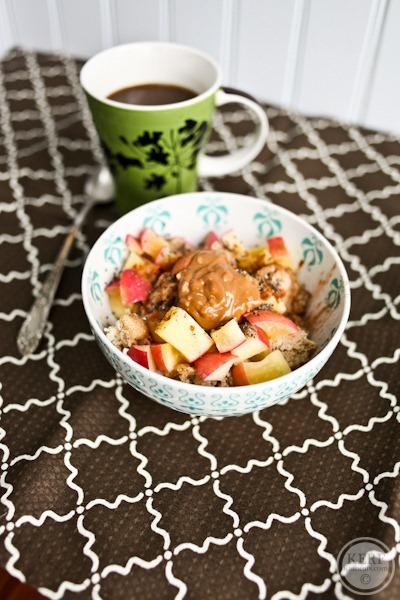 And tomorrow I am going to make oatmeal with apples or something of that nature since yours looks so good! I’ve been eating my oatmeal with pecans and pomegranate lately. Delish! I eat like lightning now too. It’s so sad! I just keep reminding myself it’s temporary! 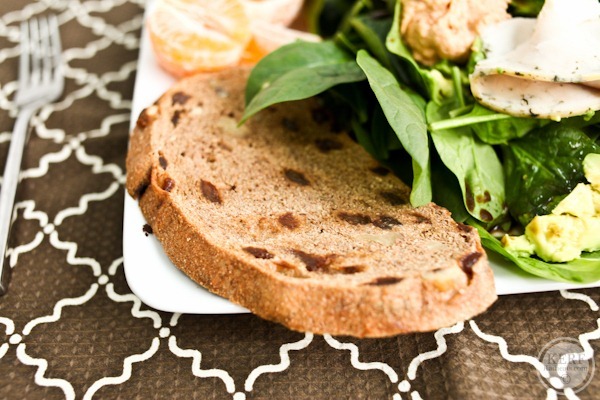 I need to get cracking on making a cinnamon raisin and walnut bread! Looks yummy! Mazen is one happy little baby, contagious smile! Love those Maze smiles! You can cook a batch of sliced apples is the slow cooker. I usually peel and slice them, add cinnamon, nutmeg and some maple syrup, cook on high for about 3 hours and they are delicious. They keep in the frig for a couple days and they freeze well too. I forgot to say to add about 1/4 -1/2 cup water or apple juice to keep them from sticking to the bottom of the pot. Enjoy! Hey Kath, I don’t comment often but I have to say you have been blessed with possibly the cutest baby I’ve seen in a long while. Mine are teenagers now and no matter how trite it is to say, it really does go by so, so fast. One thing that helped me when they were babes (22 months apart and I tandem nursed) was to let go of my previously held concept of what constituted a “good night.” For quite some time, I thought I needed and/or had a right to a night of sleep that was 7 or 8 hours, but once I redefined it in my mind (hey 3 hours, yay me!) it was a lot easier to deal with. Good advice. That might work for menopause, too! I need some GH bread in my life, stat! Kath, how do you reheat your mac and cheese? I make it about 2-3x a year (the fully cheesed out, buttery, roux-y, sharp cheddary kind with brown buttered bread crumbs) but I can never seem to recapture the same magical texture from when it comes out of the oven. I’ve tried stovetop, microwave, toaster oven, even adding more cheese. I always eat it because even slightly clumpy Mac is amazing but yours appears to look the same from yesterday. Perhaps it has a different texture or base than a roux? I don’t think I could ever put yogurt on top of mine though! Also, Mazen is just too, too cute. Makes me think of the Michael Jackson song! I love putting a salad on the bottom of any dish. Instant nutrition! Yes, it was cold here today, too. They kept saying all week how this weekend would feel springlike but I was outside most of the day freezing. Here’s hoping for some sunshine tomorrow and warmth. Isn’t it so nice to be able to eat deli meat again without a second thought?? My first meal after giving birth in November was a big sub, and I haven’t looked back. I sure did miss the extremely convenient, quality protein. Your salad looks yummy! I love his beautiful eyes popping out from the baby carrier. Such a sweet baby! 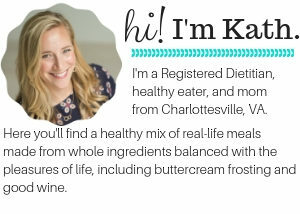 Kath, I think that I’ve been reading your blog for about a year now, and enjoy the food ideas and pictures! And of course the pictures of Maze! I’m curious about your mac and cheese! Wondering when you’ll post a recipe of it! Yes it will be live in a few weeks! 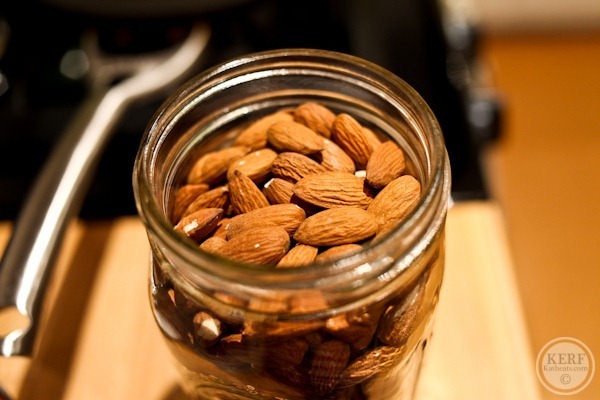 Almonds are best when they are almond-buttered. 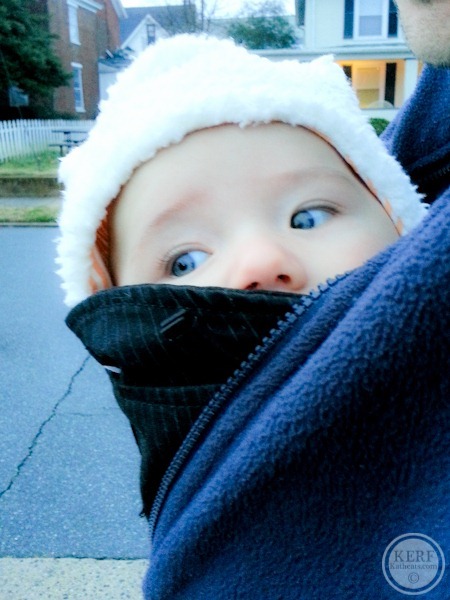 Maze is ridiculously cute all bundled up!